Raschka, Chris. 2011. A Ball for Daisy. Ill. by Chris Raschka. New York: Random House, Inc. ISBN 978-0375858611. Without the use of a single word, Chris Raschka introduces us to the world of a dog, Daisy, and the deep love she has for her precious red ball. Through the use of bright, vibrant watercolors, Daisy is seen chasing her ball, carrying her ball, and even sleeping right beside it. All is well and good until the climax of the story when Daisy takes a trip to the park with her owner and a fellow dog playmate steals the red ball and pops it. Immediately afterwards, Raschka’s illustrations allow the reader to experience Daisy’s sadness as she falls into a deep depression, believing that she will never again experience the love she once had. The plot is resolved when Daisy finds herself back in the park to find the same playmate that popped her ball, along with a new ball in the process! in the end, Daisy goes home with her precious new blue ball and couldn’t be happier. Using only brush strokes, Raschka is able to create an incredible amount of emotion in his character, Daisy. He does so by using ever changing lines on Daisy’s mouth, eyes, and eyebrows. Throughout the course of the book, Raschka successfully portrays Daisy as happy, joyful, tired, sleepy, perplexed, nervous, depressed, surprised, anxious, and jubilated. This stylistic choice can also be seen in Raschka’s fences, children’s clothing, walkways, trees, and trashcan. The use of color also contributes greatly to the portrayal of Daisy’s moods. On pages sixteen and seventeen, the colors gradually darken to create a depressed mood as Daisy realizes the fate of her precious red ball. In addition, the sky appears in shades of light yellow, green, and blue when Daisy is happily playing with her red ball in the beginning and then again returns to those shades during the happy ending. During the climax and before the resolution, the sky appears in shades of purple and gray, almost as if a storm has moved in. The array of emotions felt by Daisy as she loses her ball, shares a new one, and makes a new friend are all emotions that children are very familiar with, making this book extremely relatable. As a School Library Journal reviewer put it in 2011, “Raschka’s genius lies in capturing the essence of situations that are deeply felt by children. They know how easy it is to cause an accident and will feel great relief at absorbing a way to repair damage.” Children will walk away with the satisfaction of a closed ending and will hopefully be able to process the underlying message that resolution and happiness can come from forgiveness and sharing. 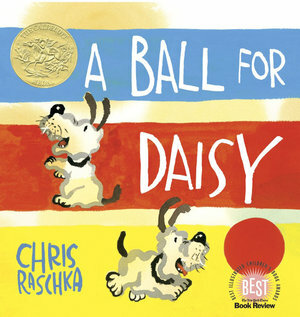 A Ball for Daisy won the School Library Jounral’s best book award of the year in 2011, a Caldecott award in 2012, and ALA’s notable book for Children award in 2012. In addition, it has been nominated for a Golden Archer award in 2013 and has appeared on many bestseller lists including Amazon.com, Barnes & Noble, Booksense, Publishers Weekly, and the New York times. A Ball for Daisy would be a perfect book to use for an ESL children’s audience in the library setting. This book would allow children to use their imaginations to the fullest and create the story in their head in whatever language they choose. It would also allow librarians to slowly introduce English words like “ball,” “dog,” “girl,” and “friend” as children point to the objects displayed in the illustrations. Other bilingual books about dogs or making new friends could be paired with A Ball for Daisy to create a storytime theme. Books in Print. Texas Woman’s University Library. Accessed September 7, 2013.